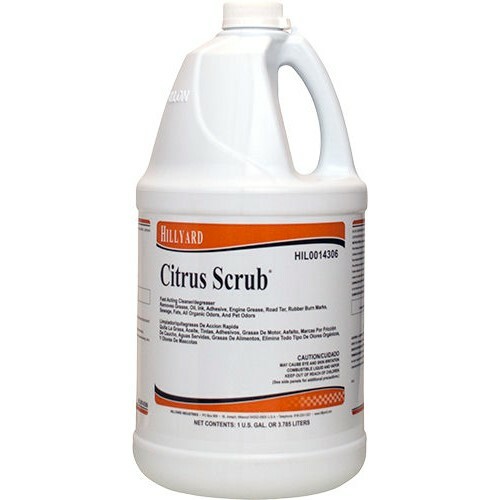 Hillyard Citrus Scrub is the Fast Acting, Cleaner Degreaser that tackles tough cleaning jobs. Citrus Scrub does an excellent job of removing grease, oil, ink, fats, tar, adhesives, and other soils, yet contains no bleach, ammonia, phosphates, harsh acids, or alkalines. It is ideal for any washable, nonporous surface, and is especially recommended for degreasing equipment, motors, metal surfaces, concrete, and other hard floors. You can even use it on carpet, check label directions and always pretest first. Citrus Scrub can be used in a wide range of dilutions depending upon your cleaning needs. Versatile Citrus Scrub does an excellent job of dissolving and emulsifying a variety of soils quickly and easily. Citrus Scrub comes packaged in special fluorinated one gallon plastic containers, eliminating the potential of rust being transferred from a metal container. Dilution rate 1 oz per gallon.